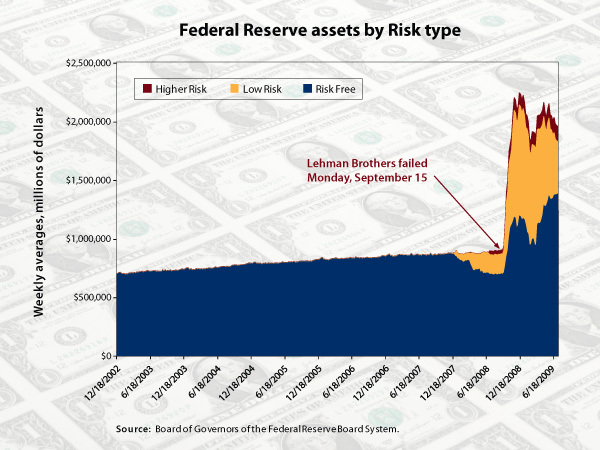 In mid-September, following the stunning failure of Lehman Brothers, the Federal Reserve scrambled to buy bonds and make emergency loans to financial institutions to prevent a further collapse of credit markets. Suddenly its long-stable balance sheet ballooned from $800 billion to $2.2 trillion. Responding to concerns that this explosion could lead to inflation, Fed Chairman Ben Bernanke told Congress that the central bank will shrink its holdings as the economy recovers. Less appreciated is the shift toward risk in the holdings themselves. Historically, the Federal Reserve has held only safe assets, including Treasury securities and gold, and tinkered with them to affect interest rates. But in the chaos of the crisis, it assumed a new role as credit market stabilizer, and took on the attendant risk. In a recent working paper, International Monetary Fund economist Peter Stella sorted the Fed’s assets into three categories: risk-free, low risk, and higher risk (see Chart).1 He showed that many of the new assets were risky and could lose money, and suggested that the Federal Reserve create a separate, more transparent balance sheet for its credit intervention holdings. 1. Stella, Peter. 2009. The Federal Reserve System Balance Sheet: What Happened and Why it Matters. Washington, D.C.: International Monetary Fund. 2. Bernanke, Ben. 2009. Speech at the Federal Reserve Bank of Richmond 2009 Credit Markets Symposium, Charlotte, North Carolina. April 30.